Teaching grammar doesn’t have to be painful lecture from a textbook or worksheet. Engage students with projects, activities, and mini-units, selling them on why grammar matters, debating its use, teaching each OTHER lessons, and making the editing process more tactile! 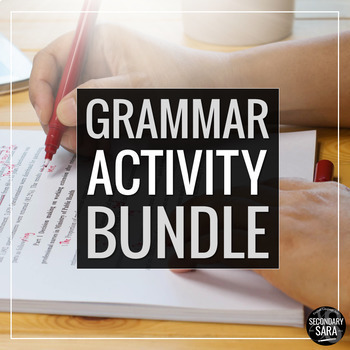 These classroom-tested projects/activities can be used in conjunction with your existing grammar curriculum to make learning engaging and student-oriented; they can be used in rapid succession or easily embedded across a school year. Please click on the links below to see full descriptions, previews, and customer ratings! •	Word Crimes: Lesson for the Music Video! •	Grammar Poetry: Learn by Writing! •	Volume I Bundle of CCSS "Short Research Projects"